Florida gubernatorial candidate and Tallahassee Mayor Andrew Gillum shows his support to students from Parkland. The 2018 midterm elections are shaping up to be a referendum on the Trump administration and its policies. Progressive Democrats have scored surprise victories in primaries across the nation, and Republican primaries seem to have favored more conservative candidates whose views are aligned with those of President Trump. One example of this trend can be seen in Florida’s gubernatorial race. Florida Democrats nominated black progressive activist and former Tallahassee mayor Andrew Gillum, while Trump ally Ron DeSantis was tapped by Republicans. Gillum was a surprise victor in the Florida Democratic primary. He narrowly defeated former congresswoman Gwen Graham—who was considered to be the front-runner—and his election was what the New York Times called “a major victory for the liberal wing of the Democratic party.” He took 34 percent of the Democratic primary votes, while Graham took 31 percent. As the chief executives of states, governors have tremendous power. According to the National Governors’ Association, governors are responsible for implementing state laws and overseeing the operation of the state executive branch. They advance and pursue new or revised policies and programs through executive orders, executive budgets, and legislative proposals and vetoes. Many governors have the power to appoint state court judges and department or agency head as well. 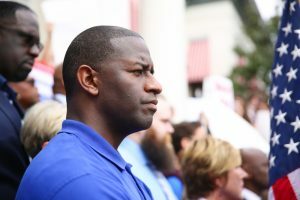 “We’re going to make clear to the rest of the world that the dark days that we’ve been under, coming out of Washington, that the derision and the division that has been coming out of our White House, that right here in the state of Florida, we are going to remind this nation of what is truly the American way,” Gillum told supporters at an event in Tallahassee. DeSantis was also considered an underdog until he got an endorsement from President Trump in June. He took 57 percent of the Republican vote, while one-time favorite Adam Putnam received only 37 percent. The president was, of course, quick to credit himself with DeSantis’ victory. At a recent rally in West Virginia, he said, “[DeSantis] was at three, and I have him a nice shot, and a nice little tweet—bing, bing—and he went from three to like 20 something.” DeSantis was very likely winning more than 3 percent of the vote before the president’s tweet, but we’ve come to see that President Trump is a big fan of playing fast and loose with the truth. The Florida gubernatorial race isn’t the only one marked by contests between progressive Democrats and Trumpist Republicans. In Georgia, left-leaning African-American candidate Stacey Abrams will run against Trump acolyte Brian Kemp for the governorship of that state. Arizona Democrats nominated progressive David Garcia, while Republicans nominated the incumbent, Republican hard-liner Doug Ducey. Races between liberal Democrats and hardline conservative Republicans are happening down the ballot to state legislatures, county commissions, and sometimes even mayoral races. It will be interesting to see how the midterm elections shape up and what they mean for the direction the U.S. will take over the next several years. 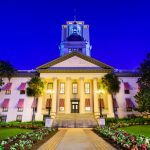 Is Rick Scott’s Investment in Fortress a Conflict of Interest?